East of Denver is Aurora, Denver’s largest neighboring city. 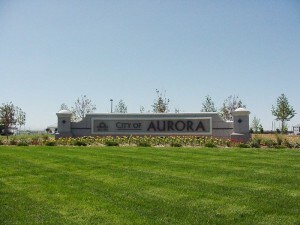 Geographically and by population, Aurora makes up the vast parts of three counties, Araphoe, Adams and Douglas, and is also the third most populous city in Colorado. The city is often considered a suburb of Denver, and this categorization is not undeserved, but there are many great neighborhoods within Aurora that lend it as a great place to raise a family. The city’s largest employer is Buckley Air Force Base which provides the area with a large military presence. Buckley is located in Aurora’s southeastern quadrant. If you are looking for a place to live, your best options will mostly be homes for rent and houses for rent, since the nearby neighborhoods tend to be much more on the residential side. Besides Buckley, the city has been home to Lowry Air Force Base which opened in 1938 and closed in 1994 and is now a master-planned community. North and South Aurora have two distinct flavors. Northern Aurora has a much more commercial atmosphere and is generally less expensive to live in than the Southern half. If you are looking for cheap apartments and studio apartments for rent, north Aurora will be a good place to begin your apartment search. It has a livelier atmosphere than the south and has a younger residency. However, if you are a family moving to the area, there are many great master-planned communities in the south that will fit this type of lifestyle such as Piney Creek, Sienna, and Saddle Rock. Saddle Rock, in fact, has received reviews by Golf Digest Magazine as being of the “Best New Affordable Public Courses” in the U.S. Golfers take note. There’s a lot going on in south Aurora that has given it high ratings for families. There’s little crime and an abundance of community parks (many pet-friendly for the family pups), shopping plazas and malls are easily accessible and the schools system has high ratings. Even for renters, the luxury apartments that are available tend to have a majority of families living in them. If you are brand new to Colorado, we hope you’ve prepared for winter. Although spring, summer, and fall are very moderate in temperature, the winters can be very cold. Average lows range from 17-20 during the winter months. If you are renting, keep an eye out for utilities included or all bills paid apartments to save money during the cold months. It’s best to use an apartment guide or apartment finder to track down these apartments. Liked: Walking distance to grocery store, gyms, Starbucks, a few cute boutiques, and restaurants. My apartment complex was young and full of recent college graduates like myself, so it was easy to make friends. 10 minute drive to Downtown. 25 min drive to the airport. There wasn't a lot of crime when I lived there; however, I heard that there was starting to be more petty theft activity in the neighborhood over which is Stapleton. Southmoor Park Elementary is the neighborhood school. The neighborhood is full of families, quiet, with nicely manicured lawns and friendly people. Great place to raise a family. RentLingo is your trusted apartment finder in Aurora. We hire local experts, such as former property managers and locators to anonymously tour and consistently rate and review every available place. They share their honest and unbiased perspective with you, so you know how every rental ranks in the area. Because our experts tour every property, we can offer consistent apartment ratings across every region. So unlike finding a Backpage or Craigslist rental, you can trust these apartments are verified and trustworthy: whether it's a cheap studio or a one bedroom with all utilities paid all the way up to a nice house for rent or a luxury condo.